The story of burns, what can they tell you? 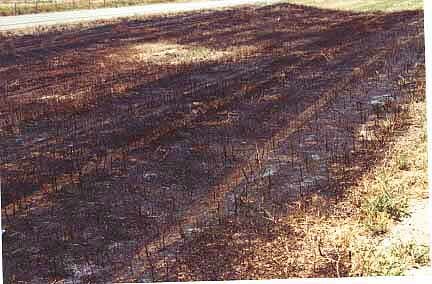 Typical roadside burn: I-5, Yolo County in the median, photo taken June 13, 2000. By looking at this photo, what can you tell about the presence or absence of perennial native grasses prior to the burn? How can accidental burns be used to locate stands of native grasses?